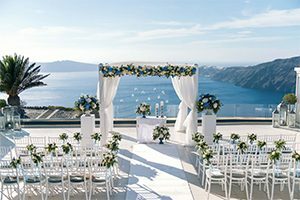 We are official Santorini wedding planners of Santorini Island, Greece and we offer a great choice of Santorini wedding packages, Santorini wedding venues, best of Santorini receptions and Santorini wedding photography at low cost. 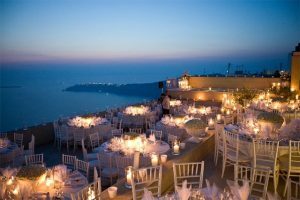 Plan your Santorini Wedding with professional Santorini wedding planners and have unforgettable moments in Santorini. 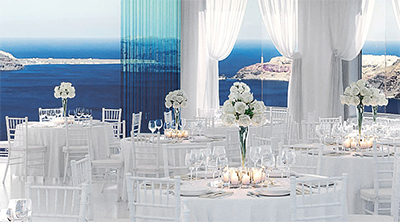 We plan Santorini weddings with style and best prices for Santorini wedding packages. 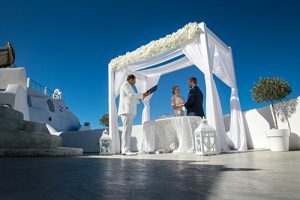 See our Santorini wedding gallery with couples married by Santorini wedding planner Nikos Sirigos! 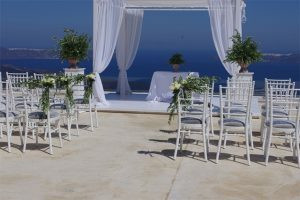 It is so simple to organize a Symbolic wedding Ceremony in Santorini! Best of all, there is no paperwork required and the Ceremony it will be exactly as a legal wedding! 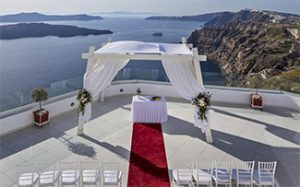 Santorini Wedding packages designed for Civil Santorini Weddings Ceremonies with low cost. legal wedding documents from your part and we will do the paper work here in Santorini for you. 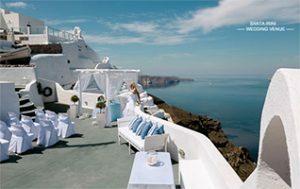 If you are thinking to elope, Santorini is one of the best Island. that we have created for you, so you can have an Unforgettable moments in Santorini . Here I will tell you How much money does it cost to elope in Santorini! Santorini is one of the best Island. 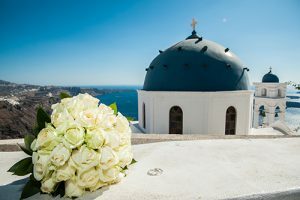 See our Elopement Wedding packages that we have created for you, so you can have an Unforgettable moments in Santorini . The grate views and the inscrutable Santorini Sunsets make Santorini Island a perfect place to propose to your future wife. in Santorini and specially during a Santorini photo tour that you might book with a professional photographer. 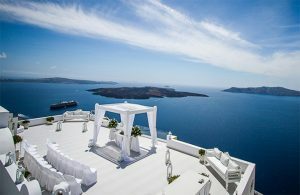 There are a lot of private wedding venues that you can have your commitment wedding in Santorini! We have some suggestions Commitment wedding packages that you can check and reside how to make the special moments last for ever!!! 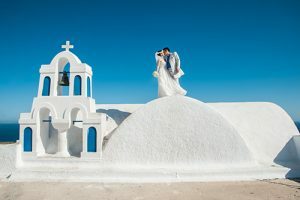 We have choose top Santorni wedding venues for your wedding ceremony in Santorini as established a huge reputation in Santorini with our wedding planing services after 15 years. 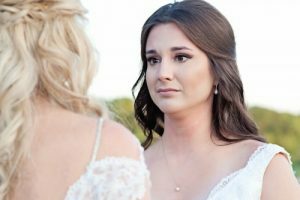 This reputation has led us to cooperation’s with all major wedding venues in Santorini, so we are more than sure that you will have best Santorini wedding venue for your wedding day and the lowers prices on Santorini island. Suites of the Gods is in Megalochori Village. the volcano the sea and nearby islands. After your wedding ceremony, you will need a reception venue to host your party. Just the 2 of you or a group of guests, from traditional to luxury, whatever you have in mind, you will find it below among the reception venues I have listed. There is a solution for any taste and any size of a wedding. Even if it is the 2 of you, you can choose a restaurant from below and I will be happy to book you a table. Please note that the Caldera side reception venues stop the music by 11pm and you need to end your event the latest by midnight. On the other side of the island, there is no time curfew. 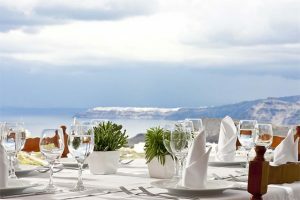 Pyrgos restaurant is in the area of Pyrgos and it is located 5 km from the center of Fira, at the highest part of the island, offering a panoramic view of the whole island. At night, it feels like you are seeing Santorini from an airplane and the city lights, sparkle like little diamonds! 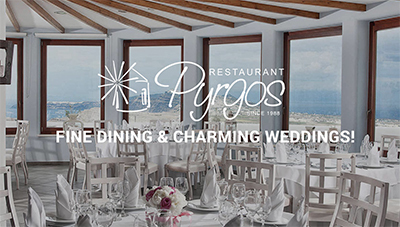 Pyrgos can accommodate any size of wedding or special event as it is consist of 4 totally private halls. This wedding venue is offered for keeping your wedding and reception at the same place but you don’t have to keep them both there. Besides the excellent service, the beautiful halls and the Greek feeling you get from the amazing food and drinks, the best part is that there is no time curfew! If you are looking for a Greek Traditional atmoshpere restaurant, with excellent food but with the cosmopolitan touch of Santorini, this is your reception venue! Please don’t hesitate to contact me with your questions at , I will be happy to answer them. 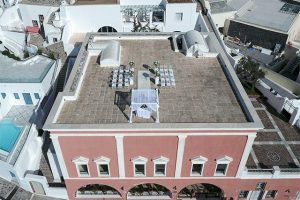 Le Ciel Santorini is a Wedding & Event Venue. You can find it on the top level of the Santorini Caldera in Imerovigli. The view of Santorini, the volcano, and perhaps the most magical sunset in Greece, is magnificent. Le Ciel boasts a large terrace to host your Romantic Wedding Ceremony. 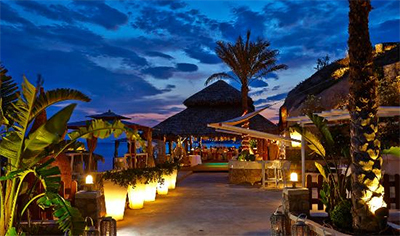 Le Ciel offers elegant indoor & outdoor spaces and a delicious choice of Wedding Menus. 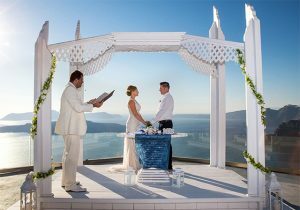 The Wedding Ceremony is held on the spectacular Caldera view terrace overlooking the Volcano and the Aegean Sea. The restaurant is spacious enough to host a wedding banquet but can be modified into an intimate candlelight dinner for two. The Wedding Reception area can cater for up to 150 seated guests. It can accommodate both your ceremony and reception. Theros Wave Bar in Vlychada beach, Santorini offers one of most beautiful sceneries to organize a wedding ceremony and reception for the most special day of your life. 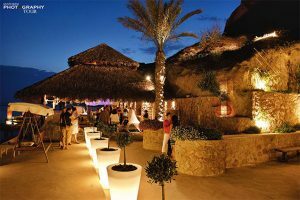 The unique, fully private location, the experience of the people of Theros Wave Bar in successful wedding receptions has established Theros Wave Bar as one of the top venues for creating a memorable wedding reception. This wedding venue is offered only if you will also keep your reception there as well and of course on a private basis. It is 9 km from Fira. Theros doesn’t accept bookings in August.